Named after Father James A. Ryder S.J, the 20th President of Georgetown University, James Ryder Randall was a 19th century poet. He was also an American newspaper editor and correspondent as well as doing short stint as a teacher. 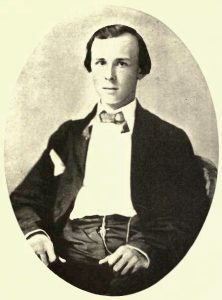 He is best remembered for Maryland, My Maryland; the poem he wrote which eventually became the war hymn for the Confederacy. Born in Baltimore, Maryland on January 1st, 1839, to a wealthy family, Randall shared a tutor with Edgar Alan Poe, although it is believed that the two never actually met. He studied English at Georgetown University; during his youth, he contracted Pneumonia twice which left him with a delicate constitution for the rest of his life. Randall did not complete his studies at the university, instead he went travelling, ending up in South America and the West Indies. On his return, he taught English literature. On April 19th 1861, he learned of the death of his friend Francis X. Ward, this drove him to write the poem, Maryland, My Maryland. The poem was published the following week in the Sunday Delta, a New Orleans Newspaper. It wasn’t until the poems words were set to music; “Lauriger Haratius” (the tune of O Tannebaum) by Jennie Cary that it became a war hymn for the Confederacy. It was later to become the state song for Maryland, consisting of 9 stanzas. Over the years there have been several attempts to change at least some of the lyrics of the poem. It is the only state song that refers to the idea of “overthrowing the federal government” It has also been suggested that words such as “Northern scum” should also be changed. However, all attempts by legislators to make these changes have thus far failed. Although Randall tries to enlist in the war, he was turned away due to his ill health. He did however marry and have several children, one of whom he named Maryland. After the Civil War, he began work as a newspaper editor and correspondent, whilst continuing with his poetry. His later poetry was deeply religious in nature but none of his poems achieved the same popularity as Maryland, My Maryland had. His personal favourite amongst his poems was “At Arlington” which he wrote following a visit to the cemetery of that name. These he had witnessed a group of Confederate women being turned away by Federal soldiers as they attempted to put floral tributes on the graves. The story goes that later that night, the wind blew the flowers onto the Confederate graves from the graves of the Union dead. Randall died on January 15th, 1908 having caught a cold during a Maryland Day celebration at which he had been a guest of honour. The ill health he had suffered since his childhood made it difficult for him to shake the symptoms off. He is buried in the Magnolia Cemetery in Georgia. On his death, the state of Maryland offered an annuity of $600 a year to his family.